Properties for sale in Brittany, France - AHIN-SIF-00937 Saint Georges de Reintembault 35420 Detached farmhouse and barns to modernise in quiet rural hamlet in Brittany. The accommodation is currently all on the ground floor. The property offers huge potential to extend into the adjoining barns or into the first floor, subject to planning. Additional land may be available by separate negotiation. The house would benefit from further modernisation but has had some improvements within the last 10 years including new upvc double glazed windows (except 1), re-wiring and new plumbing in 2003 and a new hot water cylinder installed in 2013. Viewing is highly recommended to appreciate the potential of the property. 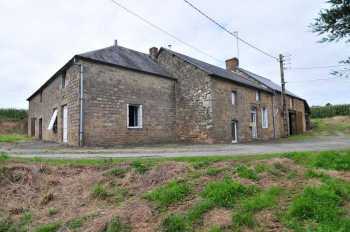 The property is situated in a rural hamlet in Ille-et-Vilaine in the Brittany region of France, near a village where you will find a bakery, bars, a post office, and a commercial centre with a small supermarket, petrol station, bank and pharmacy. Within easy reach is the Normandy town of St James (about 12 minutes drive) with its supermarket and out of town hypermarket with petrol station, street market (Mondays), post office, banks, bakers/patisseries, bistro, bars and restaurants. There is a trout fishing lake a short distance away on the road to St. James which children love, or more serious fishing in the valley of the Selune and Beuvron rivers. Although situated in Brittany, the property is just over the border from Normandy, and views of Mont St. Michel are nearby. The bay of Mont St. Michel is about 45 minutes drive and has many many attractions, as well as being an excellent base for history and culture. The Parliament of Brittany (Parlement de Bretagne) is approximately 51 km away. The closest airport is Rennes Airport (57 km) and in the surrounding area there are Dinard Airport (58 km), St. Brieuc Airport (114 km), or Angers Airport (127 km). The ferry port at Caen Ouistreham is about 150 km, Le Havre and Dieppe are about a 3 hour drive and the Eurotunnel at Calais is about a 4 1/2 hour drive. Living Room/Dining Room/Kitchen 7.07 x 4.86m Partly glazed door and window to front elevation. 2 radiators. Fireplace (at present blocked). Stainless steel sink unit with mixer tap. Space for free standing cooker. Extractor hood. Tiled floor. Utility Room/Boiler Room 2.90 x 2.53m Window to rear elevation. Boiler. Tiled floor. Hallway Tiled floor. Obscure glazed door to front elevation. Got water cylinder. Radiator. Space and plumbing for washing machine. Bathroom 2.19 x 1.12m Convector heater. Pedestal basin. Tiled floor and walls. Bath with mixer tap/shower fitment. Vent. Cloakroom Tiled floor and walls. WC. Vent. Inner Hall Laminate flooring. Door to Store Room. Bedroom 1 5.83 x 2.93m Radiator. Window to front elevation. Partly glazed door and side panel. Granite fireplace (closed). Bedroom 2 3.88 x 2.97m Window to side elevation. Radiator. Stable/Store Room 6.p03 x 4.72m Oil storage tank. Door to front elevation. First floor loft space over. Paddock. Stone Building with Fibro cement roof (used for sheep/chickens). Vegetable garden with orchard. Timber open fronted Garage 9.63 x 5.90m. Attached Open Fronted Barn 8.14 x 3.58m. Mains water and electricity are connected. Oil fired central heating. Drainage is to a septic tank. Double glazed windows.